In the small town I grew up in, there was one main road down the middle of town and when we got a Sonic put in next to the gas station, it was a big deal. Watch out everybody, we’re big city now. My favorite drink has always has been a cherry limeade. So refreshing, bubbly and perfectly tart and sweet. I especially love the cherry and squeezed limes at the bottom to nosh on once the drink is gone. I don’t frequent Sonic much anymore (unless we get a serious craving for Peach Iced Tea), but a craving for something cherry and lime occasionally still persists. Enter: This smoothie. 5 ingredients, tart and sweet, and perfect as a healthy breakfast on the go. It’s like a breakfast cherry limeade to-go. Yes, please. Most mornings we have a smoothie of some form for breakfast and I definitely see this making an appearance in our weekly rotation. Not to mention, it would make an awesome popsicle if you had leftovers. Just sayin’. Hope you enjoy this smoothie as much as we have. If you make it, you know what to do: Snap a picture and tag it #minimalistbaker on Instagram so we can be cherry limeade buds. OK? K. Cheers! 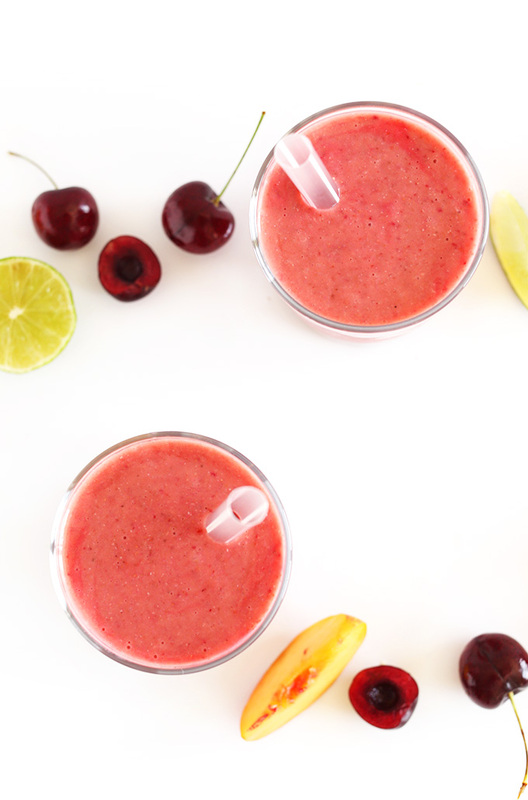 A simple, 5-minute smoothie that tastes just like a creamy cherry limeade! 5 ingredients, perfectly tart and sweet, and perfect as a healthy breakfast or snack on the go! 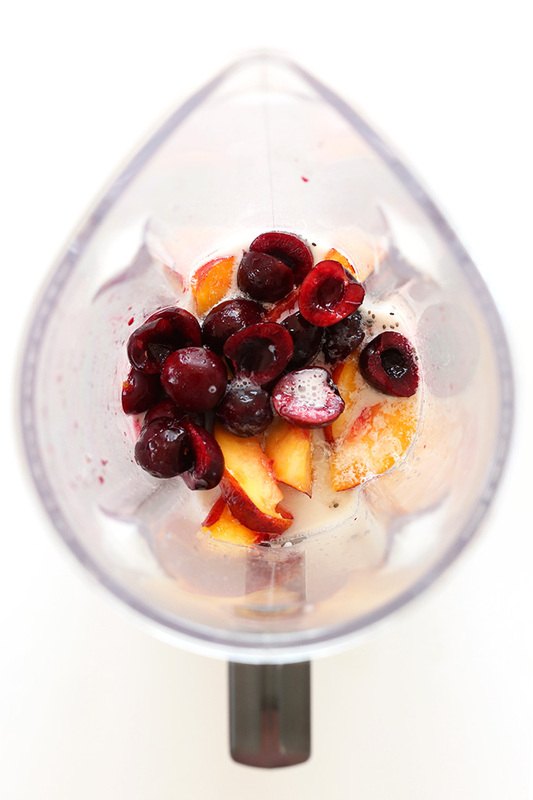 Add all ingredients to a blender and blend until creamy and smooth. 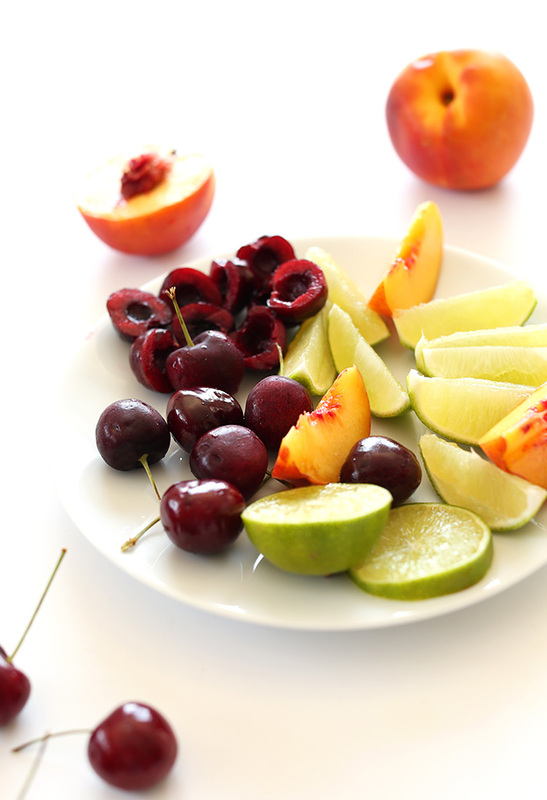 Taste and adjust flavors as needed, adding more cherries for sweetness and more lime for tart. Recipe as originally written yields 2 small smoothies or one large smoothie. Optional: Freeze leftovers into Popsicles. This was delicious. Perfect combo of sweet and tart. Will be making this again many more times. 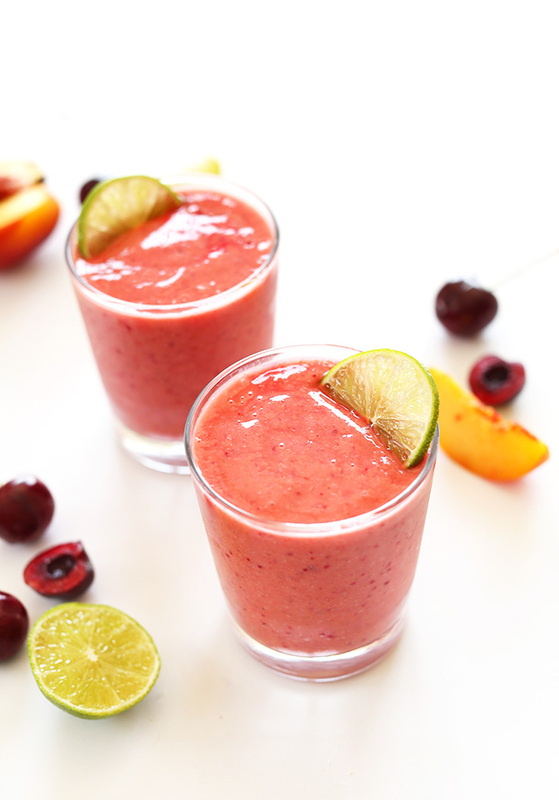 Thanks for this smoothie recipe! It is was so refreshing and perfect for a hot summer day. I used coconut water for the liquid, and it was delicious! Glad to hear you enjoyed it, Sarah! I’ve quit drinking sodas for years but there are times I CRAVE a cherry limeade, especially in 100 degree Texas. I’m happy I found this and can’t wait to try this!! Yay! Glad to hear this recipe satisfied your craving, Amanda! This is just yummy! A fun summer treat and easy to make with the Costco bag of frozen organic cherries. My husband is a smoothie convert for these flavors. This is fantastic! I added about 1/4c of oats just for bulk because smoothies are my lunch. Delicious! My daughter loves it, too. This smoothie is AMAZING! I recently purchased a HUGE basket of cherries from the farmer’s market and was on a search to figure out what to do with them. This recipe was one of the many I made with the cherries I bought, and by far my favourite! The taste of these keeps you wanting more. I have made this recipe multiple times over the past two weeks and am still loving it! Yay! Thanks for sharing, Kirstie! Try putting the liquid in first then add the solid ingredients a little at a time. Sorry for my ignorance, but, what is ‘sub water’ please? Sub water = substitute water. It’s not a type of water. It’s a command. Just found this recipe! I’m pregnant and have been addicted to cherry limeades! Could you use kefir instead of almond milk or would it make it too thick? I could eat cherries everyday.. but it’s even better if you can drink your cherries!.. 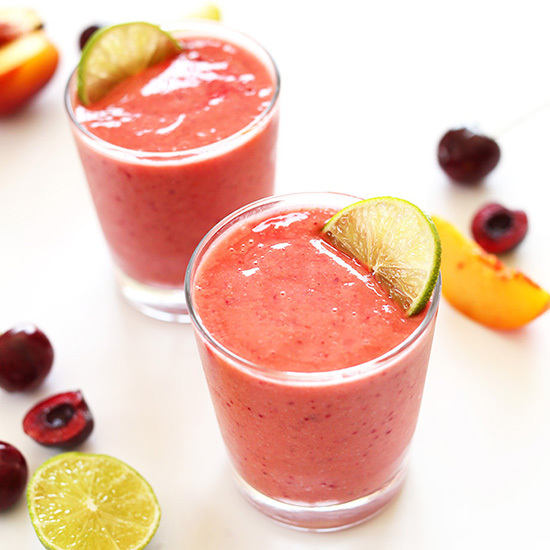 Just made this smoothie with frozen cherries and a frozen peach!.. YUM! Thanks Dana! I love Cherries! And this looks great with all the heat. I have no idea what the sonic version is like, but in 200% sure that this version is 400% better. This sounds absolutely perfect to me! I’m now craving cherries! Lovely!!! Love smoothies and this one looks especially inviting. I’m just too lazy to get my blender out… Every time I use it, it starts leaking out the bottom… Uggg. So want this right now. Love those vibrant colors! I am stuck in “banana smoothie” land, so will have to give this a try. Cherry limeade is one of my favorite flavor combos. Me too! I almost always go for bananas in smoothies. This is a nice, lower sugar departure from that. Hope you enjoy it, Debra! Oh gorgeous! A healthy version of my childhood fav. Yum! This is delicious! I only had to change the recipe a bit because cherries are long time gone here where I live. I used our home made cherry jam instead in smaller amount (1/2 cup) and added 1/2 cup of water because it was too thick with the jam. Result is probably also sweeter because of added sugar in the jam. Thanks for inspiration! This looks great Dana! I love the combination of flavours – sweet but slightly tart! i would love this kind of smoothie for breakfast everyday. I love Sonic Cherry Limeades too! When I read this, I swore you were reading my mind. I so wish I had cherries right now, but this looks so crazy good I’m going to have to run to the store to pick some up. Definitely going to try this. I adore Sonic’s cherry limeade, so I really need to try this! This smoothie is another reason you are my favorite…taking something that sounds amazing, and making it even better! Pinning this, and making it as soon as possible! Summer in a glass! haha, thanks Tammy! You’re kind. Hope you enjoy it! I don’t make smoothies enough. Which seems odd because I made them a ton during the winter but now I forget during the hot summer months. This one sounds right up my alley. Yay! 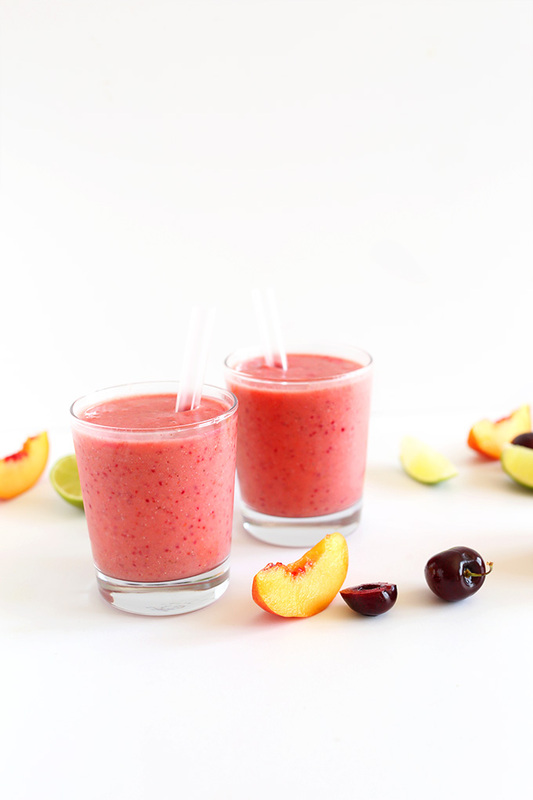 I have been looking for a new smoothie to mix up my breakfast game, and this one looks so refreshing, especially with that nectarine in there. Thanks for sharing! Sonic for the win! We live across the street for one, and I’ve been wanting to make healthier versions of some of their drinks (cherry limeade is #1 on the list!). Thank you! I don’t go to Sonic much, but, this does look delicious! I love that you added nectarines! Yeah, gives it that creamy, sweet texture. Hope you love it! Wow I was just craving a smoothie. Cherries with a little kick of lime sounds splendid. I actually just purchased peaches as well. I’m making this today! Just bought peaches? It’s destiny. DO IT! I’ve never had a cherry limeade and now you make me feel like I’m missing something! haha. I think I’ll just skip it and go right to this smoothie. I love cherries and lime so I’m sure I’d love this. This smoothie is KILLER. I dig a cherry limeade, and this is that, but actually good for me? Bonus! Smoothies really nice! Almost tastes like candy. I used frozen sour cherries so mine came out very tart but I added some honey and it was great!